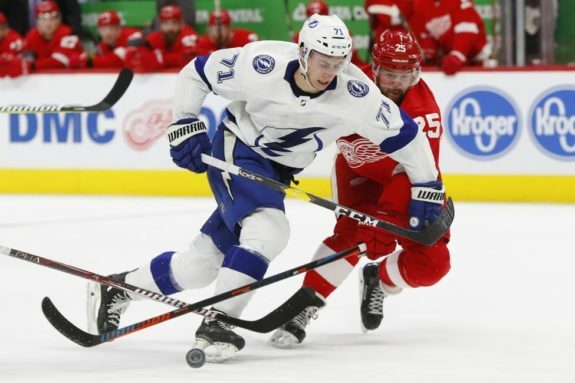 A major focus of former Tampa Bay Lightning general manager Steve Yzerman was to keep a constant flow of young, high-talent players available in the AHL so they could compete for NHL playing time at any point in the year. If a player showed that they were NHL ready, they would earn a coveted roster spot, even if that meant sending a higher-paid veteran to the minor leagues. For example, this allowed inexperienced rookies like Brayden Point and Mikhail Sergachev to muscle their way onto the opening night roster and become a permanent fixture in the line-up before reaching age 20. Throughout 2018, the Lightning had a wave of talented AHL players fighting their way into permanent roles with the team. Unlike most years, which only have one or two players make the jump, the 2018-19 season has prominently featured three rookies in Tampa Bay. This isn’t even accounting for Adam Erne, who is experiencing his first full year in the NHL after spending the better part of the last two seasons playing in the AHL and acting as a call-up when needed. 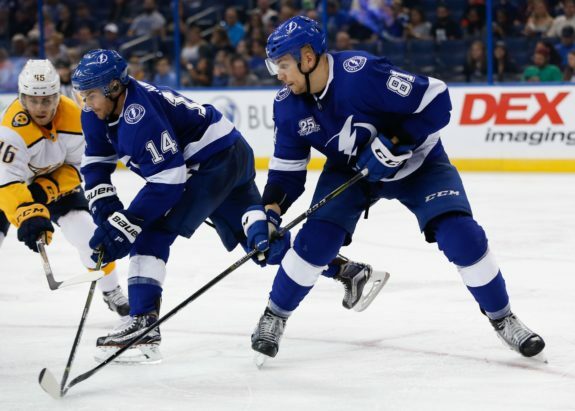 All three of the Lightning’s rookies found their way onto the starting line-up in different ways, showcasing just how flexible head coach Jon Cooper can be if you are able to prove that you are ready to play with the big club. With so many new players to discuss, let’s check in on how they have progressed at the half-way point through their first NHL season. The Lightning’s rookie wave all started with Anthony Cirelli back in March. At the time, he acted as an emergency call-up to replace an injured Nikita Kucherov but went on to score two goals in his debut game. After that impressive start, he earned a role on the team’s third line throughout their run to the 2018 Eastern Conference Final. Heading into the 2018-19 season, Cirelli retained his spot on the Lightning’s third-line while taking on a bigger role on the team’s penalty kill as well. 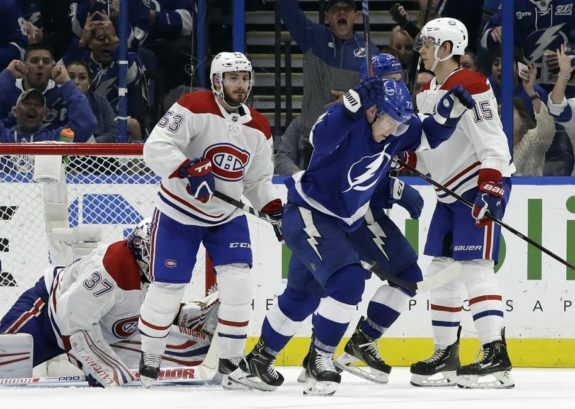 This decision immediately paid dividends for the Bolts, as Cirelli went on to score the team’s first goal of the season, a short-handed tally that led to an eventual overtime victory against the Florida Panthers. This opening-night goal was no fluke for Cirelli, either. In 41 games this season, he has posted 9 goals and 16 points while averaging about 14 minutes a night on the ice. Three of those goals he scored were scored short-handed, putting him near the top of short-handed tallies this season as well. He’s also winning more than fifty percent of his faceoffs, which is a major boon for a Lightning squad that has sometimes struggled to find consistency in that category in past years. The second rookie who fought their way onto the Lightning’s opening night roster was Mathieu Joseph. Even though he led the Syracuse Crunch in scoring the year prior, Joseph was still seen as a bit of a longshot to make the team this season. Despite this, he quickly made his presence know throughout training camp and into the pre-season. By the start of the 2018-19 season, there was no doubt that speedy winger was ready to take on the NHL. Despite missing some time due to injury, Joseph has been solid in his first 35 games with the Lightning. He has posted 10 goals and 14 points, while consistently showcasing that he is one of the fastest skaters on the team, and subsequently, in the NHL. His 10th goal of the season was a particular thing of beauty because he simply outskated Norris winning defenseman Drew Doughty, a feat one wouldn’t expect a rookie to pull off so easily. While he may not be in the running for the Calder Trophy, Joseph has been a bit of a revelation on the Lightning’s third-line. His speed and skill has added a new dimension to a role that had become a bit predictable in recent years for the team. This could pay dividends if Tampa Bay goes on a deep playoff run this season since a player with his talents can wear down opposing teams as they chase him around the ice. Erik Cernak, the final Lightning rookie this season, earned his spot with the team after he was called up to replace an injured Anton Stralman in November. Despite not getting his chance to play until a month into the season, Cernak immediately made it known that he was more than ready to take on the NHL. In his debut game, he played close to 17 minutes on the second defensive pairing alongside veteran Ryan McDonagh. Since then, Cernak has been a staple on the Lightning’s blueline. In 22 games, he has played close to 18 minutes a night, while posting seven assists, laying down 74 hits and going plus-10. Despite being a 21-year old rookie, he has the size, grit and hockey IQ to make an impact each night. Sure, he has had a few rookie moments this year, but these have been few and far between. He’s too good for us to send back,” BriseBois said. “He makes us better. He balances our right side and our left side. He and Ryan McDonagh turned out to be a really good pair. There’s chemistry there. While it’s still possible that Cernak will get sent back to the AHL when the Lightning are eventually healthy, that is looking less and less likely. His play has been exactly what the team needed this year, and as long as he continues to grow his game, he will keep getting NHL ice time. At the halfway point of the 2018-19 season, the Lightning are far and away the best team in the NHL. While this has been due to a multitude of reasons, the play of the three aforementioned rookies has been one of the contributing factors. They have positively shaped the composition of the team, giving Cooper new options up and down the line-up. As Tampa Bay gears up for their next playoff run, this flexibility will only benefit the team and their chances of winning the Stanley Cup.